During the year, we convened 11 general meetings of the Southend TUC. The average attendance was of 7 delegates, which is lightly less than 2015. We have increased the number of affiliated branches from 10 in 2015. The total affiliated membership of Southend TUC was approximately 8,700. We maintained our affiliations to the Essex Association of Trades Councils (CATC) and the National Pensioners Convention (NPC). We affiliated, for the first time, to the People’s Assembly and reaffiliated to the Campaign for Trade Union Freedom. I would express my thanks to the Ambleside Social Club for the use of their meeting room throughout the year. January - Members of Southend TUC attended and supported the picket line of the BMA Junior Doctors at Southend Hospital. February - We ran a street stall in conjunction with Southend UNISON in support of #heart trade unions week and the campaign against the Trade Union Bill. March - We supported the strike by the BMA Junior Doctors on 11th March. May - On May Day we held a street stall in Southend High Street. At our May meeting, a Junior Doctor addressed us on the campaign against their new contracts and the underfunding of the NHS. June -We held our usual stall at the Leigh Folk Festival on the weekend of 25th and 26th June. We were well received and it is clear Southend TUC stall is now accepted as part of the Festival. July - On 23rd July we held a street stall in Southend High Street with the campaign group Keep Our NHS Public to publicise the campaign against the NHS’ plans to downgrade local Accident & Emergency Departments. The Southend TUC issued a statement in support of Jeremy Corbyn’s leadership in response to the coup by right-wing Labour MPs. September - As in previous years we ran a minibus to the Burston Rally. We supported the strike by CWU members working in Post Office Crown Offices on 15th September. October - Southend TUC members took our banner to the event to mark the 80th anniversary of the battle of Cable Street. 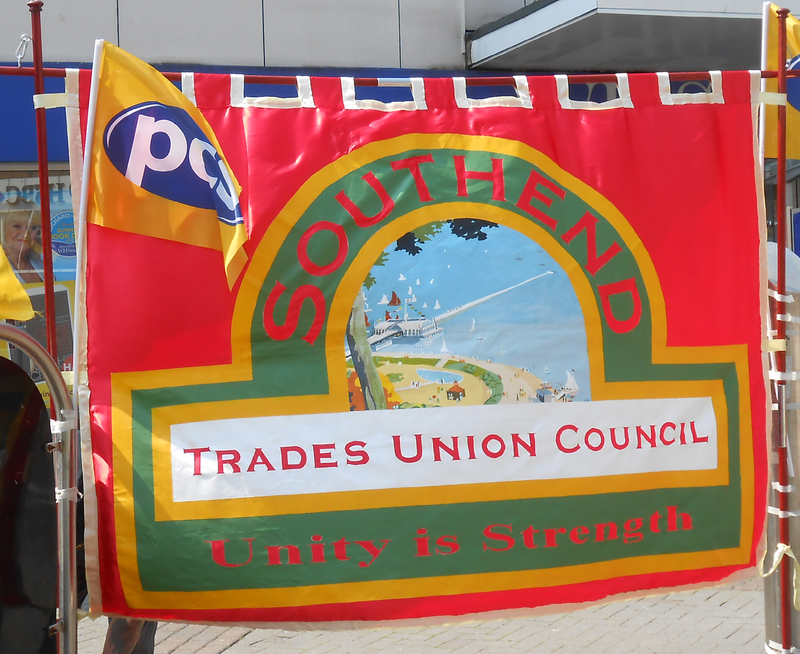 Our banner was also on display at the picket line by CWU members at Southend main Post Office on 31st October. November - We held a street stall in Southend High Street to gather signatures on a petition against the downgrading of Accident & Emergency services in South Essex. Southend TUC members also attended the meeting of the Southend Care Commissioning Group at which the petition was presented. Throughout the year, we have maintained a high level of campaigning activity, especially in events called to defend the NHS. We expressed our solidarity with striking workers and attended their picket lines. I thank all members of the Southend TUC who contributed the success of these activities. I believe that through these campaign events we have raised our profile as the voice of the Trade Union Movement in the local area.